Everything old is new again—or at least it can be. 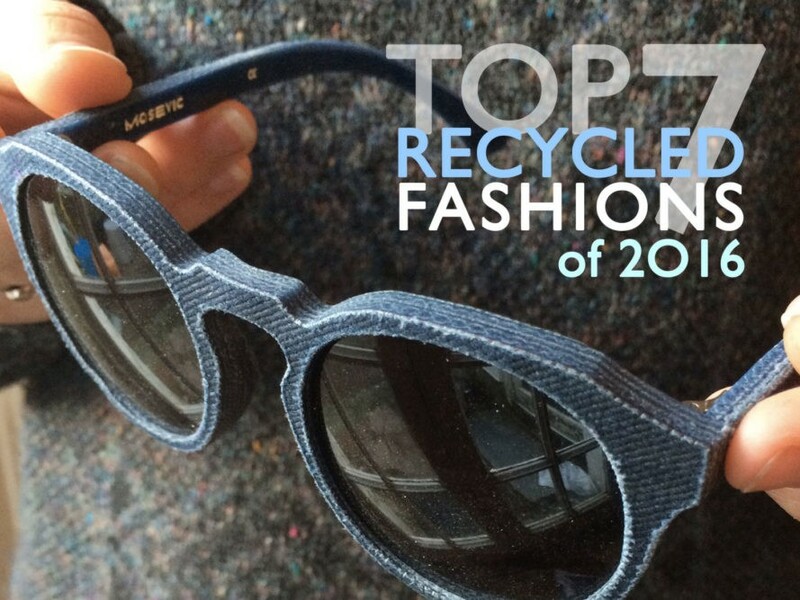 From vegan-friendly shoes made from vintage clothing and recycled plastic bottles to eco-chic swimsuits derived from recaptured ocean plastic, here are the year's most creative ways of turning trash into treasure. Above, a pair of sunglasses by Mosevic, a Cornwall, England–based brand that transforms discarded denim jeans into one-of-a-kind eyewear. Don’t stop now: Drop by our archives for more upcycled goodness. Columbia has developed what it dubs the world's first eco-friendly high-performance rain jacket to eliminate the intentional use of perfluorinated compounds. Arriving next spring, the OutDry Extreme Eco Shell is the "ultimate sustainable breathable solution for extreme conditions," according to the Portland, Ore.–based sportswear company, which nixed the class of industrial chemicals because of health and environmental concerns. The Bluesign-certified garment comprises 100 percent recycled content, from the dye-free fabric, derived from roughly 20 post-consumer plastic bottles, to the labels, toggles, zippers, thread, and eyelets. A scrappy footwear label is giving Brazil's billion-dollar leather industry a run for its money. In defiance of its country's reputation for tanned goods, Insecta Shoes, based in the southern city of Porto Alegre, makes its vegan-friendly sapatos from a blend of vintage clothing, post-consumer recycled plastic bottles, and reclaimed rubber. Everything is produced locally in small batches, which means that each oxford, slipper, and boot is few, if not one of a kind. The beaches of the Greek island of Lesbos are littered with bright orange life jackets, left behind by the thousands of refugees who arrive daily in the hope of finding sanctuary from war, poverty, and oppression in the Middle East and North Africa. Greenpeace has already tried to make something of them, working with groups such as Sea-Watch and the Boat Refugee Foundation to turn about 3,000 of the discarded garments into a massive peace sign on New Year’s Day—a “message of hope,” the environmental nonprofit said. More practical, however, are the efforts of a group of United Nations volunteers, who are refashioning the jackets into insulated mattresses for migrants seeking some—any—form of shelter. We recycle metal, plastic, paper, so why not carbon dioxide? That's the question that NRG Energy posed to the audience on Wednesday at New York Fashion Week, where the utility company hosted a panel that included Nina Garcia, creative director of Marie Claire; Paul Bunje, principal at XPrize; Marcel Botha, CEO of 10xBeta, Burak Cakmak, dean of fashion at Parsons The New School for Design; and model and fashion designer Coco Rocha. Addressing a room at Skylight Clarkson Sq in Lower Manhattan, NRG Energy vice president Gin Kinney unveiled a prototype sneaker that incorporates captured carbon dioxide in the foam of its sole. Rewilder takes the "craft" in "craft beer" pretty seriously. Based in Los Angeles, the cruelty-free label reclaims polypropylene filters, used to strain barley and hops during beer manufacturing, and transforms them into effortlessly sleek totes, bags, clutches, and aprons. "Large breweries throw these filters away only weeks of use," explain Lisa Siedlecki and Jennifer Silbert, the company's founders, on their website. "[They're] lightweight, strong, durable, breathable, and very beautiful, with a unique patina from manufacturing."